Eesysoft is the name of a data-gathering and reporting system that is available to instructors within your MyBeckett modules. It enables you to gain a greater insight into how students are accessing the VLE and interacting with your module content. Our guide to getting started with Eesysoft provides information about Eesysoft data and some of the ways in which you can use this to inform your module design. 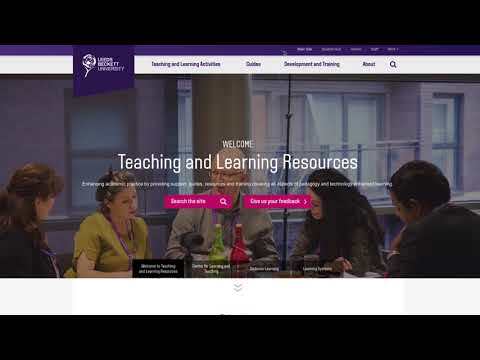 This short video introduces the site and how you can navigate to resources. The Centre for Learning and Teaching is the principal academic service in our University that supports and guides academic staff, individually and collectively, to develop excellent academic practice (DEAP). We provide expertise in all aspects of H.E. such as curriculum, research-informed teaching, learning, assessment and feedback, face-to-face, digital and blended H.E. pedagogies. The Distance Learning Unit supports Schools in their development, delivery and commercialisation of courses, mainly online, to Distance Learning students. We identify and share best practice in online course design and support, providing consultancy advice and practical help as well as commercialisation support. The Digital Learning Service (formerly known as the Learning Systems Team) is part of Libraries and Learning Innovation. We provide Schools with support, training and guides for MyBeckett, Turnitin, PebblePad and more.